Mazda-based, Kia-built, Chevy-badged. Go figure. I'm in Korea for a couple of days on my way down to Australia. 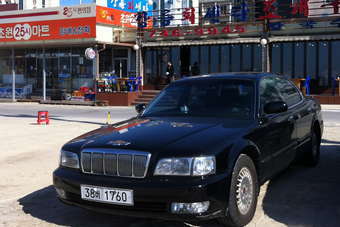 Just sighted this land yacht from the 1990s parked up in a seaside village not too far from Incheon airport. I can understand why many Daewoo owners have taken to replacing their cars' badges with the Chevy bowtie but how to explain what's been done to this, a Kia Enterprise?